One of the biggest frustrations in my life is cooking weeknight meals. I come home from work with two hungry toddlers in tow. My husband will be at work for another two hours, so I have to get dinner made and keep kids happy/safe all by myself. Generally, once a week I make a menu and grocery list, so I prep as much as I can ahead. But, anyone who knows me well knows this is a very good intention and doesn’t always happen. So, rather than sharing the healthy, balanced meals I strive for. I want to be practical and share with you an easy, go-to. Luckily, this one makes me feel like an adult because it is something I’d order at a restaurant. When my husband and I traveled to Italy a few years ago, this was one of my favorite dishes. The ingredients sound weird in English, but the Italians ensured me this was fantastic. They were right… and now I make it at home because it is also easy! Boil the noodles in very salty water. Drain noodles (do not rinse) and return to pan. Add raw eggs to noodles and let the residual noodle heat cook the eggs (you can put the pan over low heat to ensure they cook, but do not get it so hot you scramble the eggs). Toss noodles with olive oil, pepper and Parmesan cheese. 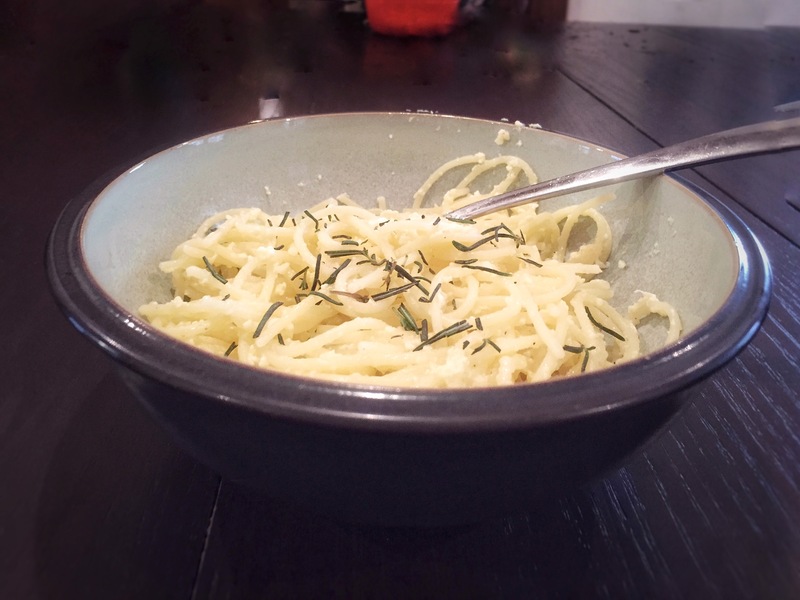 Serve immediately topped with fresh rosemary. Hope you’ll give this a try – you won’t regret it. And, your kids will actually eat it!